"Classic Italian dessert made with ladyfingers and mascarpone cheese. It can be made in a trifle bowl or a springform pan." Split the lady fingers in half, and line the bottom and sides of a large glass bowl. Brush with coffee liqueur. Spoon half of the cream filling over the lady fingers. 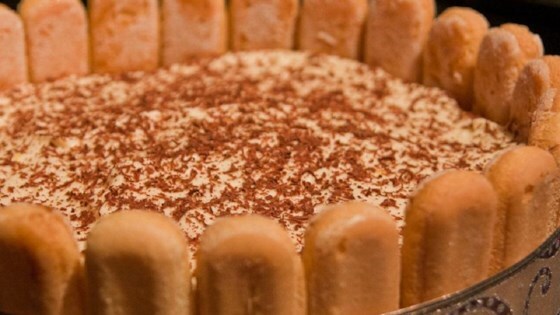 Repeat ladyfingers, coffee liqueur and filling layers. Garnish with cocoa and chocolate curls. Refrigerate several hours or overnight. Make rich, creamy tiramisu at home. Bella! It is wonderful! But mascarpone cheese is really expensive, i found a substitute... 8 oz cream cheese 2 tsp of sour cream and 2 tsp of heavy cream combined.